Over 70% of the earths surface is ocean. Take a moment to really absorb that - it's a lot. The mystery of this underwater world has fascinated me since childhood, so the sunken art of Jason deCaires Tayor takes my breath away. This British sculptor, photographer and naturalist is the man responsible for a vast collection of underwater sculptures that have been surrendered to the sea bed all over the world. These incredible sculptures provide a haven for sea life and encourage not only the reproduction of species but the exploration of our waters. Sculptures are made from PH neutral cement and frequently cast directly from the local people themselves. His deep love for the ocean was ignited in his early childhood, living by the coast of Malaysia with his English parents. His motivation is simply to defend the ocean; promote education and protect the marine environment. Among his many works, the Museo Atlantico makes it to the top of a lot of lists. Divers flock to the Museo in Lanzarote (the only underwater museum in Europe) to explore his creations up close and connect with the art that lays beneath the ocean. 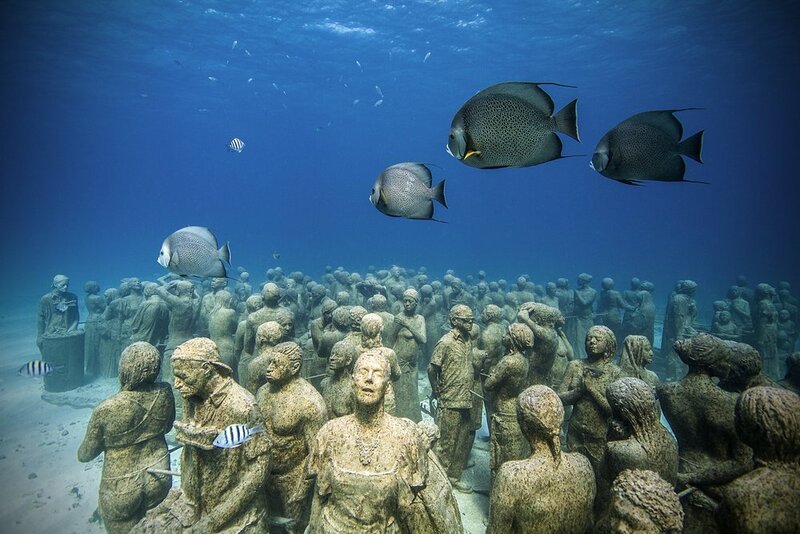 The Museo Atlantico covers 2,500 square metres of sea bed and the sculptures have been sunk to a staggering 12-15 metres deep. One installation includes 500 figures! 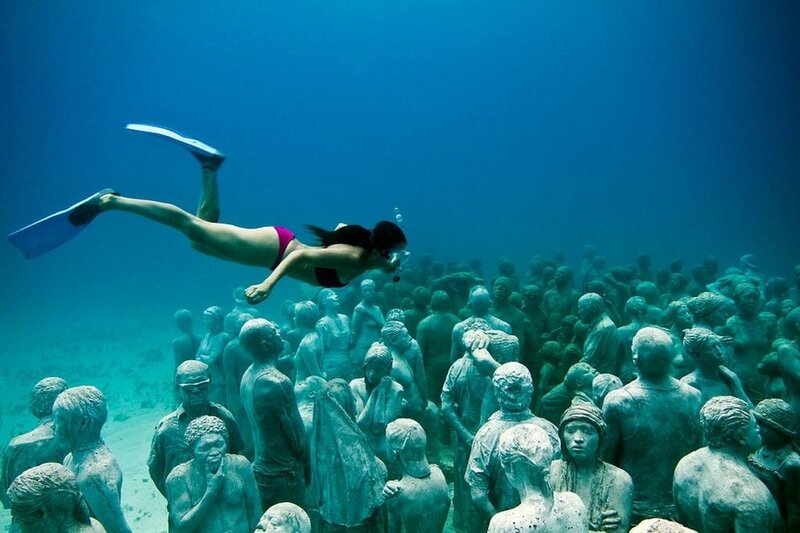 I am not an experienced diver, but given the chance to visit the Museo I would jump straight in at the deep end! A first class ticket to Lanzarote and a pink snorkel please! Over the years these sculptures have come alive with sea creatures and colour. Natural coral and sponge can be seen sprawling over the faces of these figures, with starfish and crabs adorning the cement works. A testimony to the artists environmental work. His work can also be seen in Moliniere Bay (Grenada) and is one of National Geographic's top 25 Wonders of The World. His largest piece can be found in the Bahamas; weighing 40 tonnes and measuring 18 ft tall. Entitled 'Ocean Atlas' this gigantic submerged girl is the worlds biggest underwater sculpture to date. Jason deCaires Tayor's work communicates a strong message. Hitting our humanity with an image of our world drowned under the weight of a beautiful but underestimated natural force. To me it has an air of apocalyptic stillness that I find both uncomfortable and captivating. Magical, powerful and soul possessing sunken art.